Ahoy there! So your kid loves pirates and want's a Pirate birthday party. Ohoy, Ohoy lets start planning! Make a 2 side treasure map scroll invitation. Print the party information using Blackadder font on one side of the parchment looking paper. On the other side make a treasure map. When done, rip the edges of the paper and use a wet sponge to "age the paper". Roll the invitation up and secure it with a raffia bow and put the scroll in a empty water bottle with cork. Add some sand into the bottle and mail the invites with a label on the outside. To make this pirate birthday party invitation you need to buy pirate themed paper. Print the party information using Blackadder font. Use black envelops and draw a little white scull on the envelopes to give them an edgy look. Ahoy there matyes! Ye be invited for some birthday adventures at Captain ____ birthday bash. Join Captain for long lost treasure hunt and more scarrry fun. Date___, Time___, Address___, RSVP to "phone nr by date". Only Pirates will be accepted to this party so dress appropriate. It's a pirate birthday party! So your princess should dress up as a pirate and ask guests to dress up too. Either buy or make her a costume. All your daughter needs to look like a real pirate is a bandana, a eye patch, a white shirt, stripped pants and skirts, a felt vest, and black corset. If you have not asked guests to dress up give them a mini make over when they arrive to the pirate birthday party. Provide them with bandanas, swords, eye patches, pirate hats, make-up beards, and pirate tattoos. The theme colours for this pirate birthday party are red and black. Decorate the party area with lots of streamers, balloons and pirate flags in the theme colours. A good idea is to have a personalized Happy Birthday pirate banner. Hang some rope lines and stick plastic crabs, plastic sea shells, plastic fish, etc in fish net and put empty whisky bottles around the party area. If you have a skeleton, dress him up like a pirate with a bandana, a eye patch and some earrings and place a sign on it saying "beware of pirates". Make a poster for the front door and other doors with comments like "beware, Pirates!". Draw a picture of a skull with an eye patch on the poster. Also, place a few tiki torches and pirate flags lining up your driveway. Use a black table cloth and black or red tableware - you can decorate the plates, cups with skull and crossbones stickers. Decorate the table with gold chocolate coins and with white skull confetti. For centrepiece have a huge treasure chest full with chocolate coins and jewellery. Have pirate songs playing in the background. Beforehand download some pirate songs from the Internet. Invite the girls to make telescopes. The telescopes can be made by covering one end of an paper towel tube with plastic wrap (secure with tape). Wrap the entire paper towel tube with coloured cellophane and a rubber band. Decorate the tube with markers, stickers and glitter. Invite the kids to make their own flags. Beforehand cut out flag shapes out of cheap fabric. At party time let the kids decorate the flags with markers and glitter glue. Give the kids temporary tattoos. Henna Tattoos look like real tattoos but last only for 4-5 weeks, that's why Henna tattoos are perfect for a pirate birthday party. You can create your own designs by hand or buy pre-cut themed designs. Invite the girls to make their own jewellery. Provide them with strings and plastic beads. For more detailed instructions on how to make kids jewellery, have a look at our Birthday Crafts section. We have a hole page just dedicated to Pirate party games such as Treasure Hunt, Walk the Plank, Sword Fight, Captains Hat, Treasure Toss and more. Ahoy, Ahoy, Ahoy! Have lots of fun! Look at our Pirate birthday party food ideas and pick the ideas you fancy the most! Treasure Snack Mix: Cinnamon crispix, mini pretzel, m&m's, honey teddy grahams. Tigers Blood: Red punch with ice cubes. 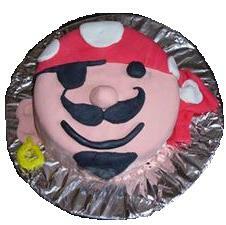 To make this pirate birthday party cake you need to make 2 round cakes. One cake is the face, the other cake you use to cut out the Captains bandana and his shoulders. Frost the cake in the colours you fancy and use a peppermint patty for the eye patch, liquorice for the string and the stripes on his shirt, chocolate sprinkles for whiskers and a new clean hoop earring. To make this pirate birthday party cake you need to make a regular sheet cake. Frost one part of the cake blue - the sea and the other part brown - the sand side, with toasted coconut on top. Place pirate figures, plastic palm trees on the land side and place a plastic boat on the sea side. To make inexpensive but nice goody bags use black lunch bags and decorate them with skull and crossbones stickers. Also, write pirate's name on them like - Captain Bootstrap Smith, Wild Eyed Miller, Cannonball Brown, etc. Fill the party bags with chocolate gold coins, plastic jewels, candy, ring pops, candy necklaces, skull ring, cross bones sucker, mini telescopes, pirate pencil, tattoos, pirate stickers. Addition to this the kids also get to keep the eye patch, bandana, sword and the pirate hat they received at the start of the party. I hope our pirate birthday party ideas will help you in your planning and I hope your little pirate will love and enjoy her party. If you have great pirate birthday party ideas SHARE them with us. We and other parents around the world would love to hear from you.